This morning was mostly spent in meetings. We started off with an employee devotional. I’ll just say I was surprised with how well the conservators sing! I worked on setting up an employee e-mail account and my future work station with my archives supervisor, Brandon (he’s super cool). Then I went on a field trip with all of the CHL conservation staff to the Church History Museum. We had a Conservation Team meeting. I got to meet Larry, the wood restorationist, and Anna, the textile and artifact intern. It was very interesting to hear them strategize about becoming a better team and hearing about what everyone’s current projects are. Then I got a tour of two conservation labs and the wood shop and related shops in the deep dark basement of the museum. 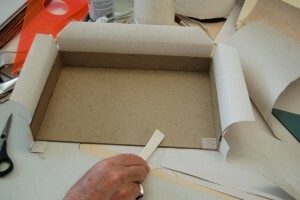 After lunch, Russ, the photo conservator, was all set up to help me build a clamshell box. I have only made one and that was 26 years ago. I remember thinking I never want to make another one of those. However, Russ is an expert (he learned from Chris-the Lab team leader- who is very cool). Russ taught me a whole new way of building a box that requires 0 math. We looked at the book we were going to house and selected cloth to match and a liner paper that wouldn’t show all of the dirt. The following photo series shows some of the steps. Beginning to glue down the cloth after constructing one side of the box. 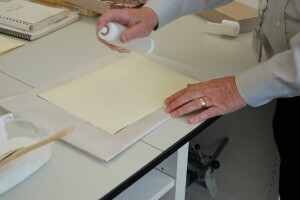 Spraying water on the back of the endpaper liner to control the curling before applying glue. 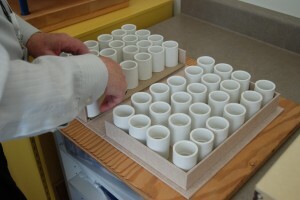 Three lid parts, including a spine, are glued onto more cloth. 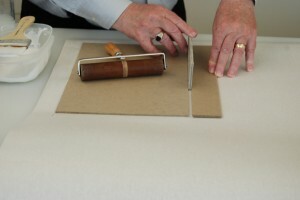 Russ holds the separator tool while he waits for me to glue down the spine piece. 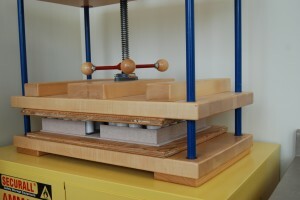 Placing supports into the open, finished box to prepare the clamshell for the book press! 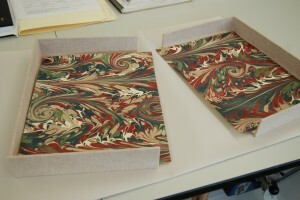 Our beautiful box is going to spend the night in the book press. I checked on it before I left and it looked pretty content. The box is sitting on a board and a second board is on top. All these precautions are to ensure the weight is distributed evenly. Tune in tomorrow to see the final product. I predict there will be one, very happy book. I spent the rest of the day working on an ongoing project. A very large collection of 19th century newspaper and magazine illustrations depicting Latter-day Saints against the political and social landscape of the time need to be removed from their frames and mats, numbered, and stacked up for archival processing. There are 9 crates of framed prints and I am helping Katie chip away at the task. 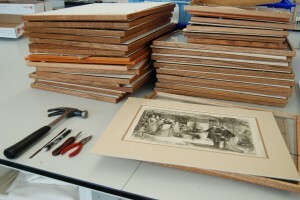 Here you can see the tools I use to remove the prints from the frames and also the empty frames stacked up in the background. 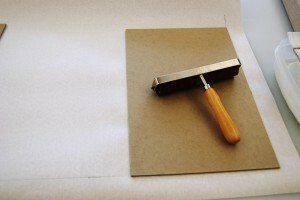 This entry was posted in Conservation and tagged boxes, clamshell, conservation, Russ. Bookmark the permalink. Wow! Great blog. It seems like you are serving your own mini-mission right now. ENJOY!! Second day and look how much you have already done! This is amazing.